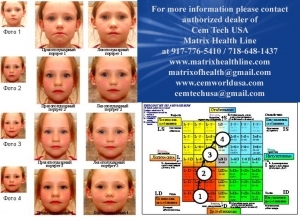 Face Psychological Analysis, based on the definition of functional asymmetry of the two hemispheres of the brain by analyzing the asymmetry of human face image, which is entered into the computer using a camera and/or video camera. 2) The degree of consistency (coherence) these oscillatory processes with each other. For these values the computer determines the psychological state of human rights and issues: psychological and professional features, the forecast behavior in extreme situations, the perception of time, psychological compatibility, recommendations for harmonizing the individual and the harmonization of the relationship. Defined as the probability of psychosomatic disorders, depending on the dominance of one of the hemispheres and consistency oscillatory processes in them (coherence). By reducing the coherence and lack of dominance of one of the hemispheres are more likely to psychosomatic disorders. By reducing the coherence of oscillatory processes in hemispheres and the dominance of the right hemisphere are more likely to spasm of smooth muscles and related psychosomatic disorders - cardiovascular system (GMI, CHD), gastrointestinal tract (gastritis, stomach ulcers) and pulmonary system (asthma). When reducing the coherence of oscillatory processes in hemispheres and the dominance of the left hemisphere are more likely to spasm of skeletal muscles and related psychosomatic disorders - muscle pain, convulsive readiness with all its consequences. Since ancient times, people tried to improve their condition, considering the reflection of her face. In the twentieth century were created by methods of psycho-correction on the basis of biofeedback, when a person looks at various display their wealth and trying to change it for the better. Developed by such methods as: mirror therapy, phototherapy, masko-therapy, skulpturo-therapy etc. A man looks at a photograph of a sculpture or a mask of his face and changing for the better. All these methods are ineffective because based on the consideration of direct display of his fortune. Significantly more effective is the method of psychological correction, based on the consideration of the difference pattern, re-created through the synthesis of two models of its state. In this case the reaction of a person on the order of magnitude stronger. Person reacts to a difference now with greater sensitivity, which leads to the launch mechanism of psycho-physics self-regulation. This mechanism is a natural property rights, but for some reason does not work. Difference pattern is the key to its launch. Psychological Correction is as follows. The computer synthesizes the two new human face - two portraits, which represent a model showing the status of the two hemispheres of the brain of this man. One of these portraits is composed of 2 halves of the right face and figuratively reflects the status of the right hemisphere of the brain investigated person. This portrait is conventionally called right-brain or "spiritual." Another portrait is made up of 2 halves of the left face and vividly displays the status of the left hemisphere of the brain investigated person. This portrait is conventionally called the left hemisphere, or "Life." Investigated person simultaneously contemplates his "spiritual" and "life" portraits and drew attention to the difference manifested in these portraits of subconscious feelings. In this case, on the basis of visual biofeedback (BFB) triggers the psychophysical self (harmonization). As a result of psycho-correction is an increase in the coherence of oscillatory processes in the two hemispheres of the brain, increases the resistance of mental processes are coordinated logical and intuitive abilities, increases psychological immunity from life's turmoil and disease. In particular, the decrease of psycho-somatic disorders due to a decrease in spasms of skeletal and smooth muscles. In addition, there is the symmetrization of a human face, because the muscles of the face, which were strained relax and the muscles that were relaxed catching up - there is increased tone. Decreases as looseness and sagging facial skin, changing the color of a person, often wrinkles, and other visible signs of "rejuvenation", or rather a return to its vital program. 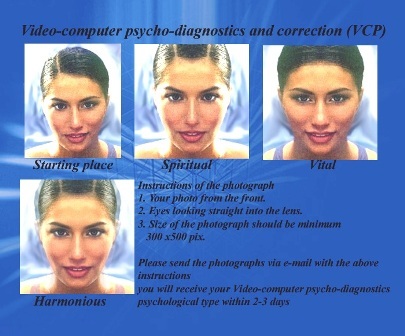 Face Psychological Analysis and Correction based on the definition of functional asymmetry of the two hemispheres of the brain by analyzing the asymmetry of human face image, which is entered into the computer using a video camera. Psycho-analysis is as follows. Computer evaluates the phase portrait of a person's face (the difference between the angles and average angles of facial features on the left and right side of the face) and determine: 1) the dominance of one of the hemispheres of the brain that corresponds to the difference between the amplitudes of oscillatory processes in the left and right hemispheres, and 2) the degree of coherence (coherence) of these oscillatory processes with each other. For these values the computer determines the psychological state of human rights and issues: psychological and professional features, the forecast behavior in extreme situations, the perception of time, psychological compatibility, the probability of psychosomatic disorders and recommendations for harmonization of the individual. By reducing the coherence and lack of dominance of one of the hemispheres increases the probability of all psychosomatic disorders. By reducing the coherence of oscillatory processes in hemispheres and the dominance of the right hemisphere are more likely to spasm of smooth muscles and related psychosomatic disorders - cardiovascular system (GMI, CHD), gastrointestinal tract (gastritis, stomach ulcers) and pulmonary system (asthma). By reducing the coherence of oscillatory processes in hemispheres and the dominance of the left hemisphere are more likely to spasm of skeletal muscles and related psychosomatic disorders - muscle pain, convulsive readiness with all its consequences. Psycho-correction is as follows. The computer synthesizes the two new human faces - two portraits, which are models that show the status of the two hemispheres of the brain of this man. One of these portraits is composed of 2 halves of the right face and figuratively reflects the status of the right hemisphere of the brain investigated person. This portrait is conventionally called right-brain or "spiritual." Another portrait is made up of 2 halves of the left face and vividly displays the status of the left hemisphere of the brain investigated person. This portrait is conventionally called the left hemisphere, or "real life". The investigated people simultaneously contemplate there "spiritual" and "life" portraits and drew attention to the difference manifested in these portraits of subconscious feelings. In this case, on the basis of visual biofeedback (BFB) triggers the psychophysical self (harmonization). As a result of increased stability psycho-correction mental processes and the degree of harmony of the individual, but also reduce the psycho-somatic disorders by reducing spasms of skeletal and smooth muscles. In addition, there is the symmetrization of a human face, because muscles of the face, which were strained, relax the muscles that were relaxed tightened - there is increased tone. Decreases as looseness and sagging facial skin, changing the complexion, wrinkles in face as if "poured." As a result of correcting a person becomes more adequate, able to manage processes. It is more realistically perceive the world and is capable of producing an adequate prediction of the future and a realistic strategic plan. At the same time he may fall impulsivity and performing arts.